After several years of sponsoring Upward Football, First Baptist Church is preparing to boldly go in a new direction. First Kids is a multi-faceted athletic program that will continue to embrace the faith-based sportsmanship of the Upward program. Jeni and Jeff Gerber will continue to be the primary directors of the program, but they would love to have your help. 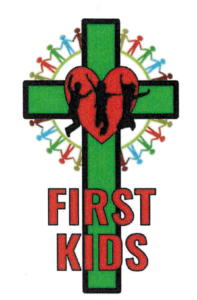 The First Kids program will gather on Wednesday evenings beginning at 7:00. Of course, we would love to have you help teach and train the kids on the athletic fields. If you are interested in this, then perhaps you would like to be a coach. You can also help us outside by volunteering to be a referee. We also will need help with set up and clean up before and after each event. Each of the participants of the First Kids program are invited to join us at 6:30 for a fellowship dinner. This is the same dinner that our weekly prayer meeting gathers around. Since we will be seeing more people at our weekly gathering, we will also need more help in providing and serving the food. Whether you would like to help by making a dish to serve, hosting a meal, or perhaps by donating toward the purchase of food; we would love to have you participate in any way that you can. If you are interested in helping, you may text Jeni Gerber (419) 205-6418 or call Pastor Dan (419) 865-9171. We would love to work with you.